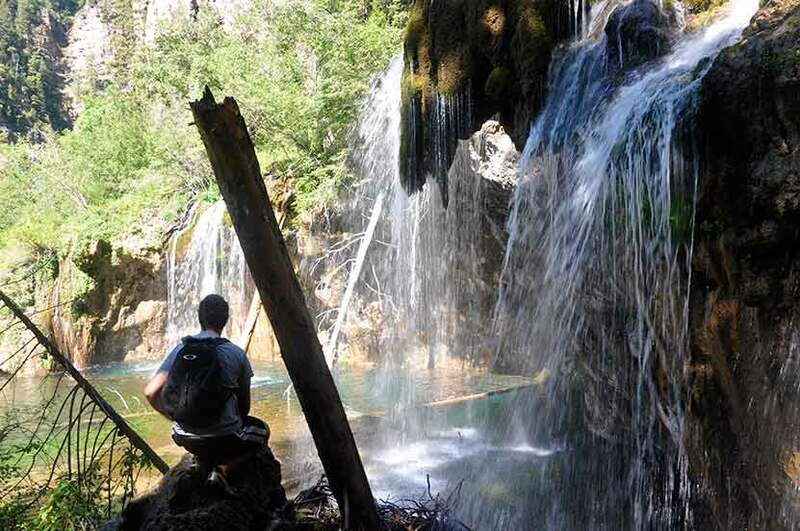 We’ve attempted to create the definitive guide to hiking the Hanging Lake Trail. In this guide, you’ll find: 10 hiking tips, notes on driving directions to Hanging Lake, and tips for parking–which runs out fast. 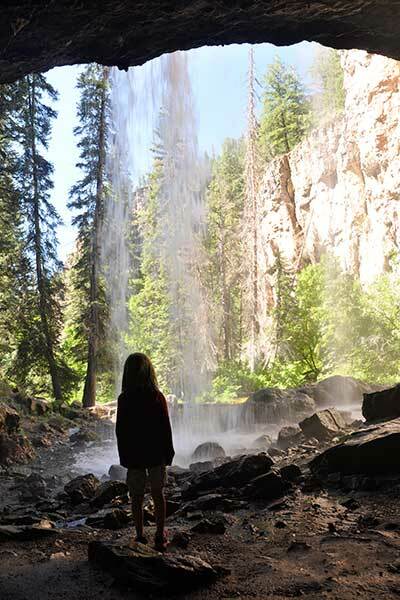 You can download the Hanging Lake trail map, find tips on photography at the lake, and some notes on hiking this trail with kids. 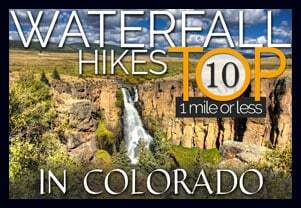 If you are planning a Colorado vacation, there is helpful information for planning both your hike and trip to this Colorado destination. This guide is extensive, so we have created a table of contents help you navigate your way around. There were a few shaded picnic areas near the parking area, and some unshaded ones along the river. On our way out, the parking lot was at full capacity with cars having to turn around and leave because there was no place to park. Parking is prohibited along the the I-70 exit ramp, so if the parking lot is full, your best bet is to drive into Glenwood Springs, grab something to eat, and try back later. Don’t wait idling or clog the ramp, it prevents emergency vehicles from accessing folks who really need their help. It’s also important to note that recreational vehicles and trailers have been banned from parking at the hanging lake parking lots as there is not sufficient space for turn around. 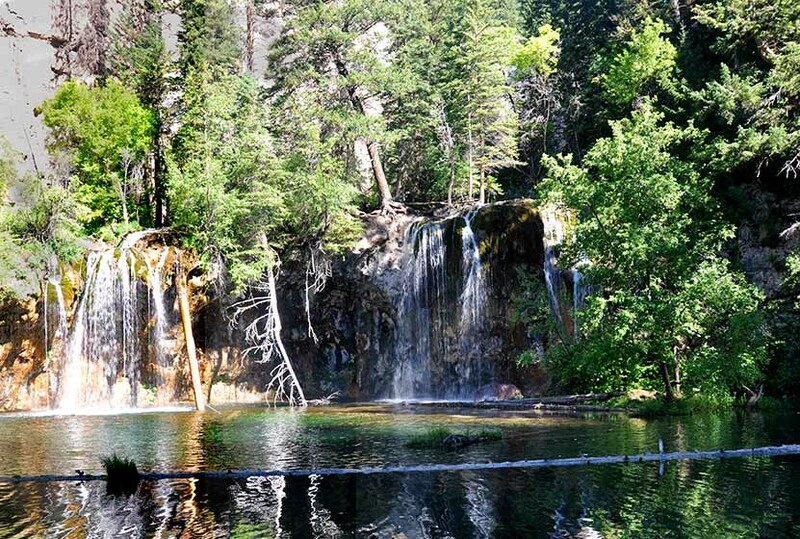 Hanging Lake is a masterpiece of the natural world. You could spend the entire morning staring into its waters and discovering new things. We spotted trout in its green and blue waters, and dippers, little birds that create nests right on the rocks along the water. There are a variety of moss, ferns, and wildflowers all along the lake. Because of all the traffic at the lake, we saw a bit of trash floating at the base of the waterfall. 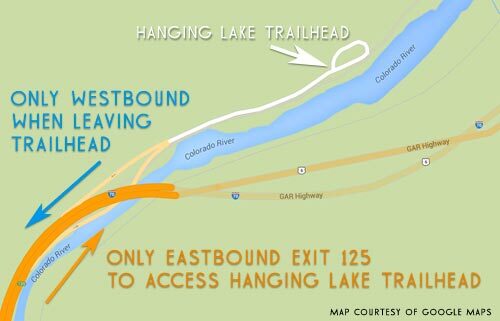 Dayhikes Near Denver would like to challenge you to look for a piece of trash at the lake and to pack it out with you. Of course, don’t go in for it, but pick up what is along the trail and edge of the lake. If we all do this, we can do a little part to help keep this natural wonder beautiful. With 130,000 people visiting a year, the impact adds up fast. There is a log that stretches out into the lake, and its tempting to walk out onto it. 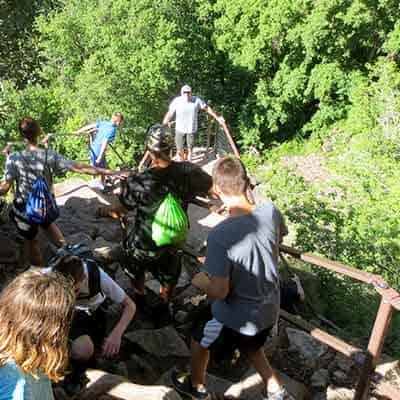 However, it’s important to know that the oils and detergents on our bodies and clothing–even our shoes just touching the water–can damage the sensitive ecosystem of Hanging Lake. So, as cool as it might be to get that pic of you out on the log, it’s even cooler to help preserve this place for the next generation who gets to see it. 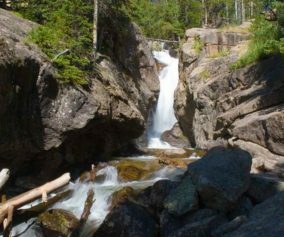 On your return, be sure to hike the short spur (about 200 yards) up to Spouting Rock Falls. That’s right, it’s plural–there are multiple falls. 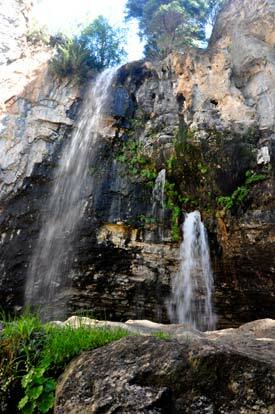 This set of waterfalls is much higher than the Bridal Veil falls at Hanging Lake, and instead of pouring over the cliffside, the falls shoot out from holes that the water has carved through a sheer wall of limestone. When the water is really flowing (which is most of the time), an additional gusher of a falls spills out from the heights above Spouting Rock, creating a breathtaking series of waterfalls. The real problem is that part of the waterfalls and lake are in direct sun and part in in the shadow of the canyon walls. This makes for two very different exposures within the same frame. So, that’s why we recommend that you go earlier or much later when the sunlight is still indirect and diffused. For some incredible shots, be sure to walk over to the back side of hanging lake where you can take photos that reveal the area carved out under the falls–but be sure to keep out of the water. The trail got busy quickly, so we found ourselves stopping often and stepping aside to let others pass us. Our children were particularly taken with the snails we found along the trail when we took breaks. The snails are easy to miss, but if you just stop and look around for a moment, they seem to appear from out of nowhere. However, we eventually found and reserved amazing campground. In fact, it’s so good that I’m hesitant to share it. We booked a campsite at Bogen Flats Campground along the Crystal River. It was a 1 hour drive from the campground to the hanging lake trailhead. Though, not as beautiful, you could camp at Redstone Campground, which is a bit closer. 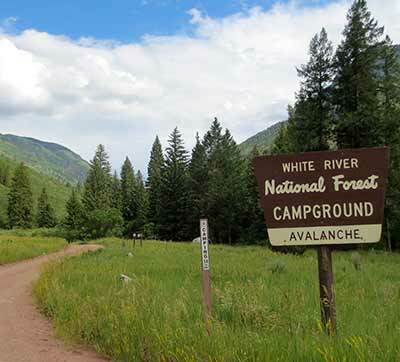 We would also recommend (if you have a good clearance 2WD vehicle), the Avalanche Creek site–no reservations required. You can rent a private cabin or home using VRBO – Vacation Rentals By Owner (affilate link). 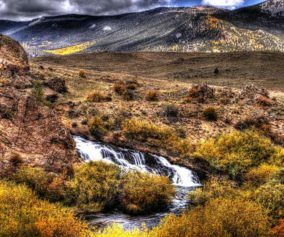 The Hot Springs at Glenwood Springs – Sit back and soak in the main attraction and namesake of Glenwood Springs, Colorado. This is a perfect way to recover after your hike up to Hanging Lake. Glenwood Caverns Cave Tours and Adventure Park – Go on one of the many different cave tours, or seek some above ground thrills on the parks many rides and attractions. Rafting – There are a ton of rafting outfits in the Glenwood Springs area. Check out this Glenwood Springs page for a listing of Colorado guided rafting tours. 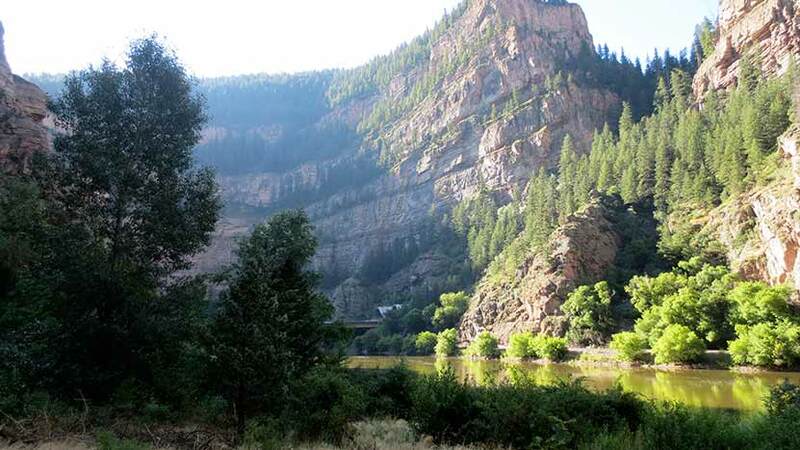 A Whole Lot More – Glenwood Springs was voted as one of the best vacation spots in the West–there is just a surprising amount of fun to be had in this Colorado town. The best place to really explore and find out more about the area’s attractions, see the Visit Glenwood site and begin planning your trip. 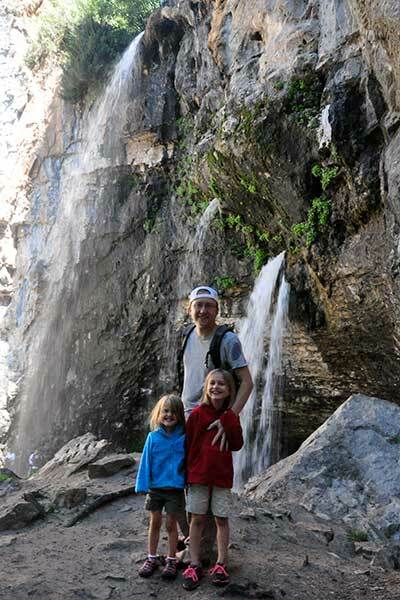 Follow Dayhikes Near Denver’s board Hanging Lake Hike, Colorado on Pinterest. For a great example of engagement photos, check out Kristen Hakes Photography’s photo shoot at Hanging Lake and Spouting Rock. 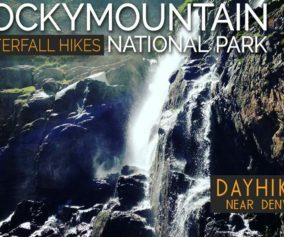 This is an absolutely beautiful hike and a must do for any resident or tourist. However is can get very busy so I’d plan the day wisely. This is a great trail profile! Hanging Lake is one of my favorite hikes in all of Colorado. It’s about a 2.5-hour drive from Denver, but is well worth the trip. 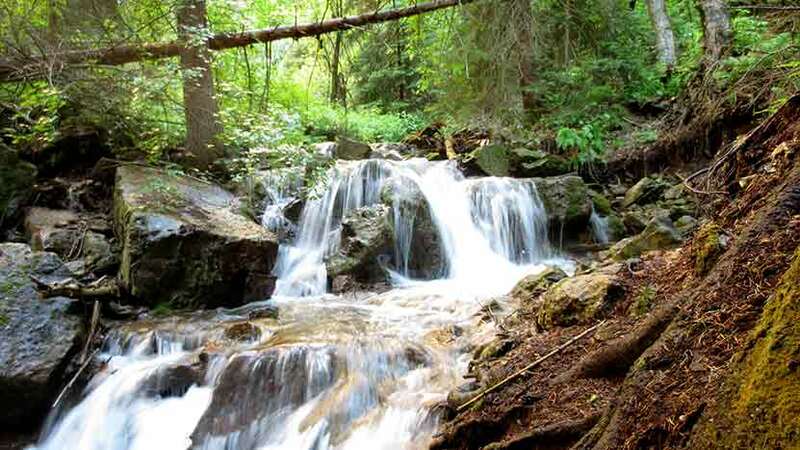 The scenery and falls are stunning and it’s a nice, cool, shaded hike on a hot summer day. As the trail profile mentions above, definitely get there early (I’d recommend by 7:00 or 7:30 am) if you’d prefer not to hike with hundreds of other people, and take your time on the climb, especially if you’re not from CO. The trail is pretty steep and feels even more so if you’re not used to the altitude here. You will not be sorry you hike here. Sooooo breathtakingly beautiful!! Nothing like it! Warm days are tougher then cooler days. You will burn a lot of calories! There are plenty of supporters coming down the mountain if you need a little pick me up. Everyone is very happy when they make their way back down. There are many places to stop for a quick rest or to catch your breath. After climbing all the way to the top the views are incredible! Hanging lake is more beautiful than the pictures show, the waterfall is gorgeous and the wildlife, the fish, the chipmunks, the birds are just as pretty! I did notice that there were kids throwing rocks into the lake which was quite disappointing so please tend to your children and educate them why this isn’t a play place, no disrespect to the parents, I have a feeling that they just didn’t know. Please stay on the trails and stay off the fallen logs as well. 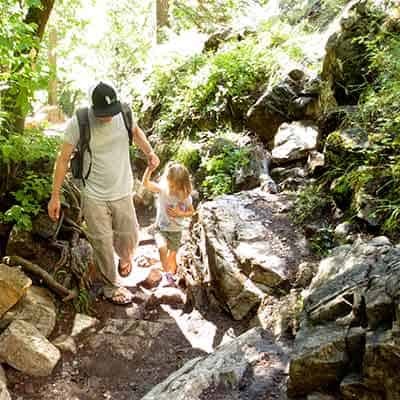 A hard climb for seniors as well as small children due to the incline and length of the trail as well as some slippery and narrow spots. 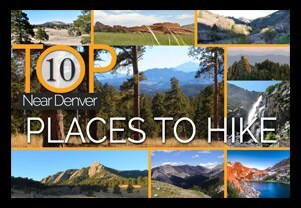 Overall, you don’t want to pass up this hike! We will be going again in the spring and I personally can’t wait! The view and sound of the water is well worth the hike, recommend going during the week and getting there early. Seems to be very crowded on the weekend. Go in the Spring to see the best waterfalls. The hike is long and strenuous but well worth the effort. The scenery is great along the trail and even better at the lake. Give yourself plenty of time to enjoy hike and be sure to take water for the trip up and back. Oh, and do not for get your camera. This is my favorite trail of all. Number one, get there early. The parking fills up the later in the day and it gets warmer and warmer in the summer. This is almost a mile straight up. It took us almost an hour to get up. And the view is absolutely spectacular. The lake is breathtaking.Bring plenty of water, and don’t forget to take lots of pictures. The trails actually national trail now and maintained by the Boy Scouts. 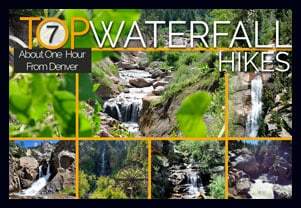 If you’re in Denver this is a trail that you should definitely make sure not to miss. In the summer the trees give you shade on your way up but I would still get there early to avoid the crowd in the heat. Hiked this in late September with my 60 y.o. wife who is a non-hiker. We encouraged her to use trekking poles which ended up being her salvation, along with the quarter mile markers along the trail, which gave her little goals. Much of the hike is along the stream which descends from the lake so there are nice stream views along the way. Agreed to give yourself plenty of time and take a snack or meal to enjoy at the Lake where there are benches to rest. The lake is small (more like a pond) but the clarity and color are unsurpassed in Colorado. Remember no dogs, swimming or fishing. The short leg up to spouting rock is well worth it as you can easily walk behind the falls. Remember your drinking water, this is Colorado. Conquered this bad boy last weekend, what a great hike. Also, what a great guide for what to expect. We heeded your advice and got there at 5:45 (still not the first ones on the trail, but there were only a few others). By the time we were heading down (about 9AM), the trail was getting packed! One of the great things about getting there that early is that we got to see 2 different versions of the canyon, one in early morning light before the sun hits the canyon, and one in the morning with the sun peaking through the trees lighting the features beautifully. Anyways, this is a great hike and be prepared (lots of water)!! A beautiful hike to an even more beautiful destination! Another suggestion for beating the crowds: we started up the trail at 6pm on a Wed in July and probably saw only 2 or 3 dozen people the whole hike up and back. An hour and 15 min up (for out-of-state 60-yr-olds) and a little less than an hour back down got us to the bottom again just at sundown, with a good half hour to enjoy the lake and the spouting rock. A good time for photography, too. We could find no evident exit from westbound I-70 at exit 121. Plan to return all the way to Glenwood (9 miles) in order to get to eastbound I-70 during this construction period. What a thorough review of the hike and your experience! We can’t wait to visit :). The line to get into the rest stop was packed at 11:30 a.m. I parked five miles away at the next restop called Grizzly Bear or Grizzly something. One of the locals droped me off at hanging lake and I carried my roller skates so I could skate back to my car. There’s a bike path that runs along the colorado river. I suggest riding a bike to hanging lake or getting dropped off. Great pictures! 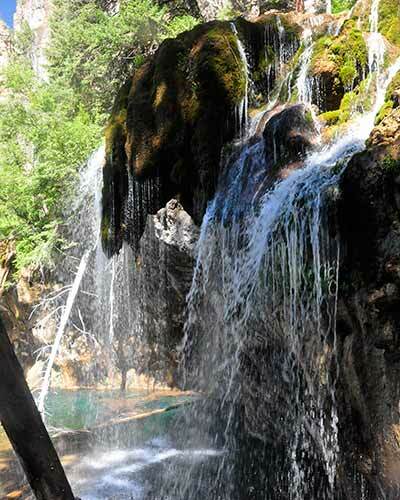 I can’t wait to get to Hanging Lake. Last summer I was in the area and tried several different times to get in the parking lots, but they were always full. The lake is being overrun and destroyed by hordes of visitors who ignore the signs to not enter the water. Again, body oils and detergent on clothing destroy the delicate travertine. So sad to such beauty destroyed by selfishness and disrespect of visitors who cannot look and not touch. It was very dismaying to finally get up to that gorgeous lake (really, a magnificent emerald pond with waterfalls) and find that of only 3 couples that were up there besides me, EACH ONE sent 1 or both family members tight-rope-walking as it were along that big fallen tree trunk that is partially submerged, to get photos of those yo-yo’s standing in the middle of the lake. Each trespasser’s shoes or sandals made frequent contact with the lake water as they crept out from the shore and back. There was a sign that looked to be brand new right where the log meets land, that repeated a message that had been on the numerous trail signs: stay out of the lake–in this case the sign said “Stay off the log”! If the Forest Service is serious about keeping that supposedly “fragile” ecosystem safe, they are going to have to post a ranger up there, which of course will mean charging admission to the trail to pay for that cost, and closing it when he/she is off-duty. But that will protect this place from creeps who despite numerous pleas to our good will and common-sense, cannot resist the urge to be a photo-op prima donna at the expense of irreplaceable beauty. Or maybe some cameras with strobe lights like they have at some Denver intersections to catch those who run red lights would be a deterrent. Probably a lot less expensive to the public. It just seems that if 100% of the visitors during an evening on an off-season weekday are trashing the place like I saw on 9/27, it is well-overdue to do more to stop this abuse. Or is the lake less fragile than we are told? 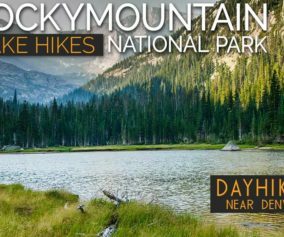 I love this hike and really enjoyed reading your guide! I actually just hiked it yesterday and there are now fences and signs preventing you from the behind the falls view and from going out on the log. They’ve also fenced off the upper area between spouting rock and the falls. You can still go behind spouting rock though ??? ?